By Ralph L. Angelo Jr.
Long ago we discovered a copy of E.E. “Doc” Smith’s classic sci-fi novel, “The Skylark of Space.” What impressed us was how the action centered around two civilian scientists who build an amazing spacecraft and come up with the means to launch it into deep space where they have many fantastic adventures. Smith is often credited as being the father of that sci-fi sub-genre known as the Space Opera. But at that time most such tales generally featured military heroes whereas not so in this story. The fact that the heroes were civilians was one of the many aspects of the book we enjoyed and so remember it fondly to this day. Which brings us to Ralph Angelo’s “The Cagliostro Chronicles,” a bonafide space opera that follows in Smith’s footsteps with its protagonists being the crew of a civilian made spaceship. Genius aeronautical engineer, Mark Johnson, has built the massive Cagliostro and outfitted here with a unique magnetic engine of his own invention that will allow it to travel faster than light; in effect transport him and his crew to the far reaches of the galaxy in the blink of an eye. He and his hand picked crew are about to embark on a “shake-down” flight when Johnson’s friend, General Abruzzi begins acting very strangely. Johnson suspects, for whatever illogical purposes, the general not only does not want him to launch the Cagliostro but is in fact planning to forcefully take it from. Heeding his instincts, he takes off ahead of schedule and sure enough finds the entire Earth Space Navy chasing after him and his crew. Using their new FTL drive, they manage to escape to the farthest reaches of the galaxy and there, Johnson confides in his team; made up of a beautiful telepath named Ariel, a super-strong security chief and several other gifted scientists. Under secret orders of the President, Johnson has learned that evidence exist of alien incursions into out Solar System and has been ordered to discover the origin of mysterious space messages intercepted by the government. The Cagliostro’s first mission is to discover who is sending these transmissions and what their intent is. We found this first half of the book slow. Understandably Angelo was burdened with laying out the basic plot, identifying his characters etc.etc. in the basic set-up. Still we kept hoping the pacing would pick and are happy to report it does so in grand fashion once we get to the inhabited, alien worlds. From that point on Angelo is clearly channeling classic pulp writers like Doc Smith and Edmond Hamilton as he propels our likeable heroes into one adventure after another as they eventually realize the Earth is in jeopardy from a full-blown alien invasion armada. By the time they race back to our Solar System, there isn’t a moment to spare. Clones of government officials have infiltrated the highest branches of the government and are working to assure the invasion’s success. Exposing them is only a small part of the ray-blasting action. Now it is up to Johnson and the crew of the Cagliostro to orchestrate a viable defense strategy that will give the Earth forces a chance to survive the coming onslaught. 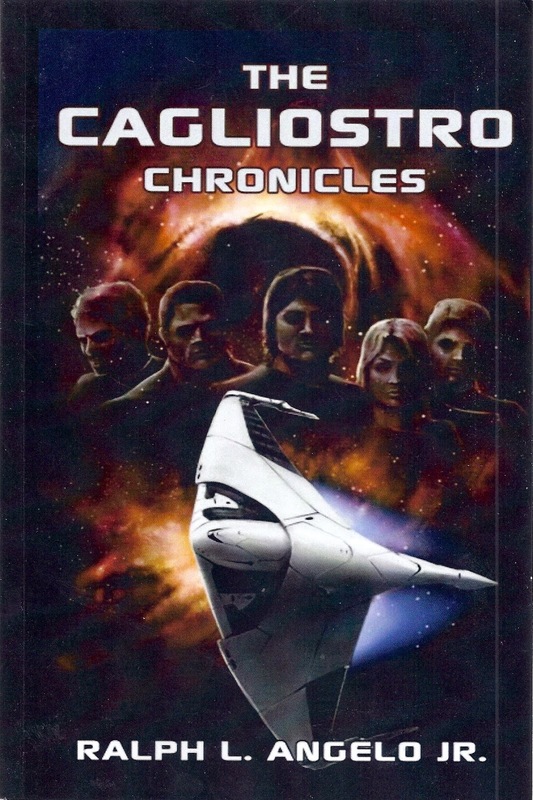 If you like super space battles with thousands of ships engaged in a life and death struggle, with heroes larger than life and last minute rescues, “The Cagliostro Chronicles” was written for you and all Space Opera lovers. It is a headlong rush into the wonders and dangers that mankind will some day have to confront. Let’s hope we have real men like Captain Mark Johnson to lead the way. When you read through 470 pages of a book and it seems like you only just started, you know it is a special book. When you read a book that takes place in the majestic Rocky Mountains of Colorado while at the same time dealing with a lost Sherlock Holmes tale by Arthur Conan Doyle, it’s a good bet you’ve gotten into a truly unique and original adventure. All of which are the hallmarks of the Special FBI Agent Pendergast thrillers by Douglas Preston and Lincoln Child. Easily one of the best New Pulp series on the market today, the adventures of Agent Perdergast are always a treat filled with the bizarre and unexpected. Alone, both Preston and Child are excellent masters of action fiction; together they are unbeatable. In this, the fourteenth of the series. Pendergast’s young female protégé, Corrie Swanson, finds herself in the exclusive ski resort of Roaring Fork, Colorado. As a student of a prestigious criminal justice college, Corrie has traveled to the remote mountain town in hopes of examining the recently exhumed bodies of eleven miners who were supposedly killed and eaten by a grizzly bear in the late 1800s. All of this is for a thesis paper she is writing. But when she exactly sees a few skeletal remains from one of the bodies, Corrie spots an anomaly that doesn’t corroborate the recorded cause of death. Because of this revelation she is soon arrested and thrown in jail for trumped up charges by some of the wealthier townsfolk afraid of what she has accidentally uncovered. Of course word of her incarceration doesn’t take long to reach Pendergast and he arrives days later to rescue Corrie and investigate why she was illegal imprisoned. But before his own detective work can get rolling, Roaring Fork is beset by a serial arsonist who targets the most expensive homes in the community. This unknown sadist invades the rich mansions, overcomes the residing families and leaves them to burn alive in the fiery conflagration. Thus it would appear Agent Pendergast is dealing with two separate cases and that beomces his conundrum; whether they are independent affairs or in fact actually related to each other. And if so, how? And why does the hundred years old grizzle bear killings involve a lost Sherlock Holmes story? The word page-turner is all too often carelessly dropped into a review without any real justification. 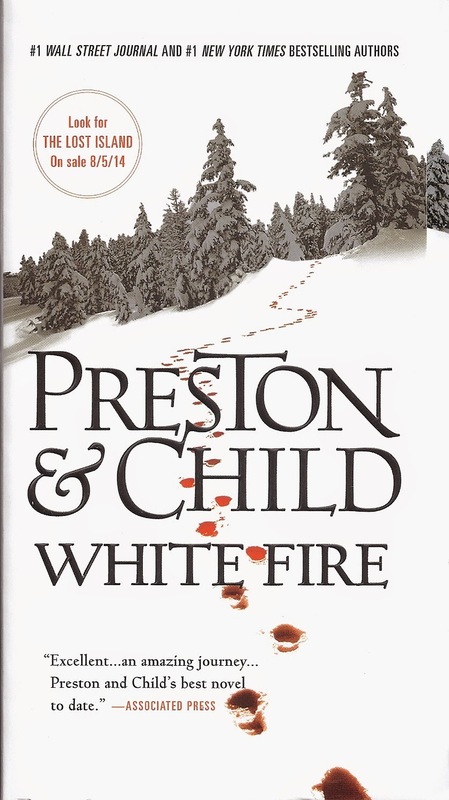 In this case, there is no other way to correctly describe “White Fire.” We’ve been a fan of the Pendergast series since its inception and soundly declare “White Fire” to be one of the best thus far. It never misses a single beat in its literary melody of suspense and thrills. A few years ago we were introduced to the black pulp avenger, Doc Voodoo in his debut novel. It was an auspicious one and in our enthusiastic review we made it quite clear we wanted sequels. Now that wish has been answered in a marvelous fashion by author Dale Lucas affording we readers with another fast paced, wall-to-wall action thriller that is truly great reading experience. In 1927 Harlem, the Italian mob boss, Harry Flood, has plans on taking over the neighborhood. To do so he sends his goons to murder the leading community leaders which include the highly respected Reverend Barnabus Farnes amongst others. At the last possible moment, the skull-faced, gun-toting Doc Voodoo comes to the rescue. Farnes is totally unaware that the voodoo empowered avenger is actually Dr. Dub Corveaux, the kind-hearted, dedicated man of medicine who is sweet on his daughter, the lovely Fralene. Incensed by his men’s failure to eliminate their targets, Flood cunningly plans to fight fire with fire, taking his lead from the mysterious black clad crime fighter. He finds a Haitian witch and has her summon a demon to possess Rev. Farnes. At the same time, a self-serving, black entrepreneur, Jebediah Debbs, tired of the pastor’s non-violent approach, begins to arm Harlem natives so as to form their own vigilante committee and deal with the mobsters’ threat bullet for bullet. Now all of Harlem is on the verge of a massive blood-letting and its one shining hope for peace has become corrupted by unknown forces. Suddenly both the skills of Dr. Corveaux and the abilities of his scary alter-ego will be called upon if catastrophe is to be avoided. But can one man stand alone against the tides of both human and supernatural greed and cruelty. Mixing classic pulp elements of both hero and horror genres, Lucas once again puts forth an amazing, totally gratifying tale that is as good, if not better, than the first book in this series. 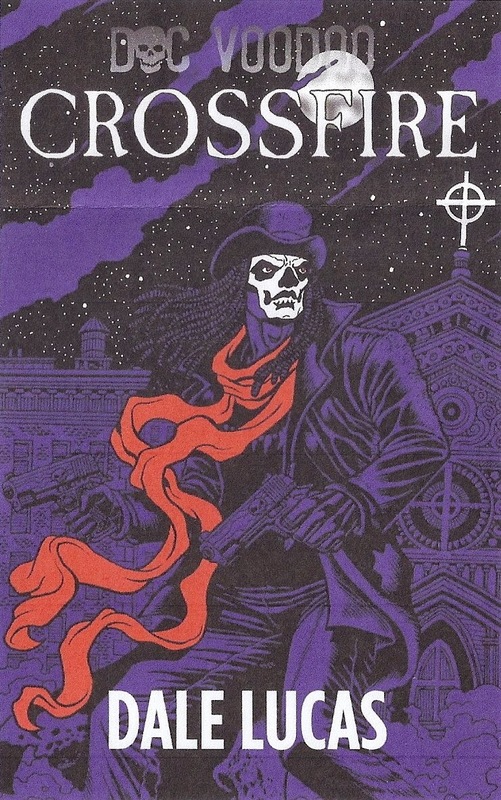 “Doc Voodoo : Crossfire,” is easily one of the best pulp novels we’ve read this year and we will be nominating for several pulp awards come Jan. 15, 2015. That good? You can bet your bones on it. There have been several husband and wife mystery-writing teams in the past but only two have ever both won the coveted MWA Grand Masters award; Margaret Millar and Ross McDonald and the authors of this book. “The Spooks Lights Affair” is part of their Carpenter and Quincannon series and if this entry is representative of the earlier cases, we may have to go dig them up. In 1895 San Francisco, Sabina Carter and John Quincannon are partners of a well known and respected private detective agency. Although they usually work as a team, in this book we find them handling their own individual cases. Carter has been hired by the wealthy St. Ives family to shadow their rebellious, overly romantic daughter, Virginia. It has come to their attention that the girl has been seeing handsome young store clerk who does not meet their upper-crusty standards for an acceptable suitor. Alas, the girl is frustrated by having the tenacious private eye on her heels constantly. On a fog shrouded night, while both are attending a sumptuous gala hosted by the mayor; Virginia attempts to elude Carter and dashes up the side of a steep hill where she commits suicide by throwing herself off a cliff. As tragic as these events are, they take a quick turn towards the mysterious when an extensive search of the area below the cliffs fails to find Virginia’s body. It has somehow disappeared, vanished into thin air. Meanwhile the always ambitious Quincannon is attempting to hunt down the solo bandit who robbed a local Wells Fargo office of thirty-five thousand dollars. The bank has offered up a tidy reward for anyone who can find the culprit, bring him to justice and retrieve the stolen funds. Thus it would seem the sleuthing partners are dealing with two separate cases. But when they compare their notes, they discover that several of the people they are investigating have connections to one another. How is dead girl’s older brother connected to one of the shadier figures involved with the bank heist? What was the true role of the dead girl’s beau in her demise and subsequent disappearance? Is he also part of the daring robbery? The plot is complex and fun to follow. Even more so is the authentic setting in which it plays out as Carter and Quincannon give us a wonderful tour of San Francisco in its gilded era from the infamous Barbary Coast to the rich Tenderloin gambling houses and garish brothels that catered to the city’s wealthiest men. 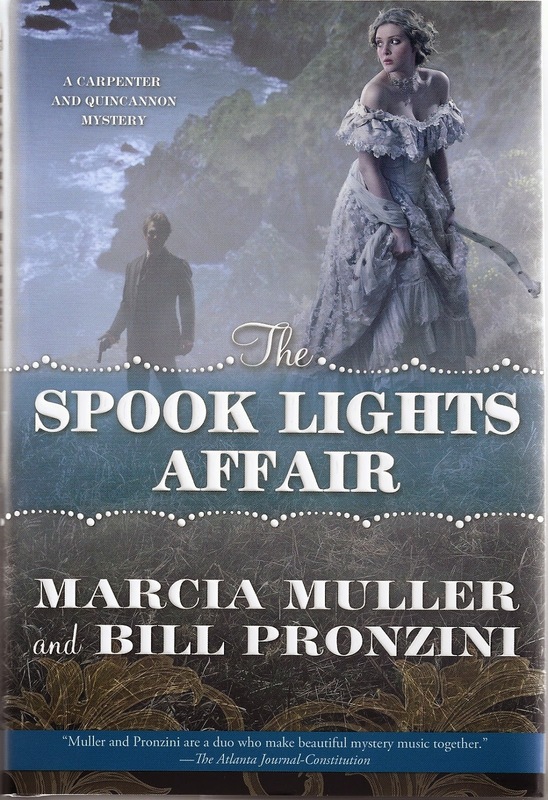 “The Spook Lights Affair” is both a terrific mystery plus a rollicking time-travel adventure populated with truly colorful figures both fictional and historical. It is a fun romp by two masters of their craft who obviously enjoy working together much to their readers’ delights.